Having acquired my first classic, a blue 1964 PV 544 only days earlier, I had just six days (and nights) to prepare the car (or at least make it roadworthy) for the big day. Simple things were required! Like de-sludging the petrol tank, fuel lines and filter, unblocking the carb jets and draining the water from under the passenger seat, oh yes, and making the brakes effective. Six am on Sunday 5th May and I was underway from Guildford to Heathrow to pick up my navigator brother Paul who had driven from Peterborough to meet up with me. The car had only run for twenty minutes or so and "Special Stage One" was completed an hour later when we met up at the Holiday Inn, Slough. Having transferred navigator and AA book to the Volvo, off we set for Longleat House and the ten o'clock start of the rally. Was it one hundred and fifty miles to the start? We don't know as by now the mileometer (actually kilometers in a lhd PV) had packed up as had fuel gauge, trip and wipers. Anyway we passed scrutineering! Proudly fixing our rally number 234 on to the car, we signed on and had time to inspect the classic machinery of the other 249 competitors, a display of all sorts, all pristine, both sports and saloons, classic and modern. We saw John Haynes take the start at ten o'clock driving a superb Jaguar XK 140 then we waited patiently for our start at 11.50 am. During the wait we met many new friends who admired "Touch Wood", our nickname for the PV as we were touching wood to finish the tour. 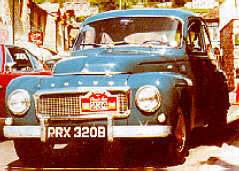 Two other Volvos were on the run, number 152, a 1965 122S crewed by Mr and Mrs Skipper of Eastleigh, and also in a 122S, a Mr Trim from Dorchester. Eventually we were underway with our excellent Haynes route map and instructions. Out of Longleat and into the beautiful Somerset countryside, we had made the start and were off. Twice we conked out for no apparent reason but both times "Touch Wood" restarted first time. Through Frome, Radstock and Midsomer Norton, all checkpoints were found and signatures received. In open country now and into the Mendip Hills. What about the brakes, will they hold out? By now the sun was shining and we were enjoying a brilliant warm summer Sunday - the heater was stuck on too! Into the Cheddar Gorge and there were hundreds of cars and spectators to circumnavigate, halfway round now and going well. Then (spoke too soon) a single track road downhill towards Wells proved the brakes needed more than just adjustment, they were fading fast and we were gathering momentum just as a Dormobile came chugging uphill towards us painfully unaware of our predicament. We made it through the narrowest of gaps, and the handbrake served a useful purpose, although the cable now needs changing. We decided the time was right for a cool-off which allowed the brakes to return to some semblance of normality. The final stages, through Wells and a busy checkpoint in the town center, Shepton Mallet and Castle Cary, found us on our way to the finish at the Haynes Classic Car museum at Sparkford, along the last straight around the last corner and under the finish banner. We were there and it felt great, we had made it. All finishers received a brass commemorative memento, lunch was devoured (at four fifteen!) and we rested to recharge our batteries. Then a quick visit to the museum and then "Stage Three" of our personal rally, the drive back to London on the A303. Tired but very happy we made it back to London. The end of our first rally and a most enjoyable day.